Yeah, I don't think we talk about gear being a factor quite enough in sports like football. I remember the days when Cliff Branch used to make his gloves extra sticky in order to lead the league with 13 TD catches one year and end up being a key cog for the Raiders. Those are some sweet gloves, and I bet you felt like Randy Moss just wearing them haha. Troy Aikman in a broadcast recently was talking about how he never found good gloves to use during his career, despite trying every product out there. When the weather was cold and/or wet, he'd find the ball much harder to grip and his accuracy would decline. He had the little hand warmer thing back then that everyone still uses now (that little fanny pack like thing you see QBs use from time to time), but it wasn't the same as having gloves on. He said he tried on the gloves that the QB in the game he was broadcasting was using, and it was like a revelation. Aikman claimed that he'd probably have used those gloves regardless of the weather conditions, because it was probably a better grip than his bare hand. Interestingly in rugby there is a ban on gloves which cover the fingertips. I agree. 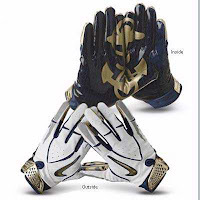 Those WR gloves are amazing. Anecdotally, it seems to me a lot of QBs don't wear gloves, and those that do tend to have a hard time adjusting when they are forced to wear gloves (due to weather, injury, or other factors). I remember Collinsworth going on about Ben not being able to put any touch on his passes while wearing gloves a year or two ago, so Ben was rifling passes on slants and curls instead of tossing fades and swing passes. Also didn't Stafford place his accuracy issues on the gloves and not his broken finger last week? I don't understand why they don't keep a tighter control of these things. Same thing with hockey sticks. Hockey sticks have turned that into a fundamentally different game than it was 15-20 years ago. There are lots of things you simply couldn't do before. Ditto with these sticky gloves (which I used as a soccer goalie). They are insane. So sticky. You can palm an object much larger than you could without them. Those gloves are amazing and yet Roy Williams still drops half his targets. A little off-topic, but Joshua is right about hockey - not just the size of the goalie equipment shrinking the available net, but the new sticks allow similarly strong players to shoot up to 20% harder. So goalie play today is far less reflex, and much more positioning and luck. Also skates and hockey gloves are far lighter than 25 years ago, resulting in increased speed. In Formula 1, rules are put in to slow down the cars - otherwise technological advances would make them far too fast. Other sports don't seem to be as concerned.